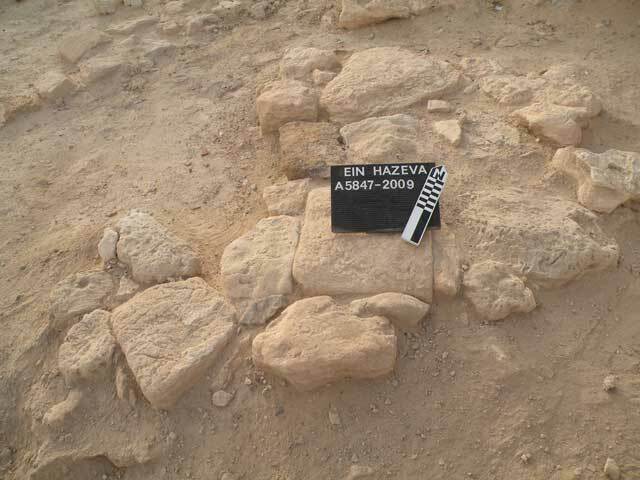 Over the course of several days in January 2003, February 2009 and October 2010, localized excavations took place at ‘En Hazeva (Mezad Hazeva, also called ‘Ir Ovot) in the central ‘Arava valley (Permit Nos. A-3818, A-5761, A-5847; map ref. 223298/524272; Fig. 1), to facilitate conservation work at the site. The excavations, under the supervision of the Israel Antiquities Authority and funded by D. Coxon, the director of the Blossoming Rose organization, were directed by T. Erickson-Gini (field photography), with the assistance of K.M. Bekes (Blossoming Rose), P. Jaso and Y. Lender. Additional assistance was provided by Sky View (aerial photography; taken in 2013), V. Essman (surveying and drafting), L. Kupershmidt (coin cleaning), D.T. Ariel (numismatics) and members of the Blossoming Rose organization. ‘En Hazeva (Arabic: ‘Ein el-Husb) includes remains from the Late Iron Age I, a tower and remains of the Iron Age IIa, an Iron Age IIb fortress and a Roman fort and camp that appear to have been part of the Diocletianic military build-up in the region that took place with the transfer of the Tenth Legion from Jerusalem to Ayla (‘Aqaba) at the end of the third or the early fourth century CE (Erickson-Gini 2010:68–74). 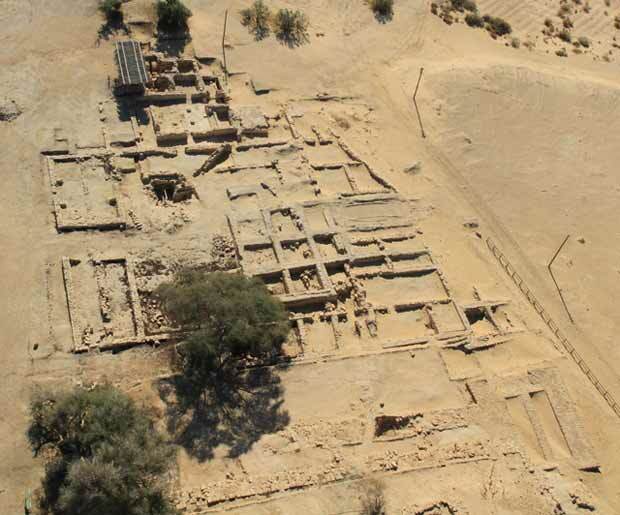 The site is located on an important ancient road running southeast from the northern Negev through the Nabataean/Roman site of Mamshit (Mampsis), Ma‘ale Zafir (commonly identified as the biblical Scorpions Pass) and onwards to the copper mines of Faynan on the eastern side of the ‘Arava valley. The site was first noted by A. Musil, who in 1902 drew a plan of the Diocletianic fort situated on the summit of the tell next to the spring of ‘En Hazeva (Musil 1907:207–209, Figs. 114, 115). The site was later visited by F. Frank (in 1932; Frank 1934:254–255) and by N. Glueck (in 1934; Glueck 1934–1935:17–20, 115). Following Y. Aharoni (1963:30–42), the identification of the site with Thamara (Thamaro/Tamar) of the classical period is widely accepted. Among the ancient sources that refer to Thamara/Thamaro are Ptolemy’s Geographia (5:15) and Eusebius’s Onomastikon (8), according to which a garrison was stationed there, at a distance of one day’s journey from Mampsis on the road from Hebron to Aela (Aila; ‘Aqaba), the headquarters of the Tenth Legion. 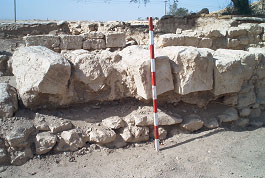 The site appears in the Peutinger Table as a station along the Elusa (Haluza)–Aila road and in the Madaba Map, where it is marked between Prasidin (Praesidium), south of the Dead Sea, and Mo’a, now identified as the Diocletianic fort at Bir Madkur (Erickson-Gini and Israel 2013:44). It should probably be identified also with Thamana, listed in the Notitia Dignitatum, where a Roman unit subject to the Tenth Legion, the Cohors quarta Palaestinorum, was stationed (Dodgeon and Lieu 1991:344). 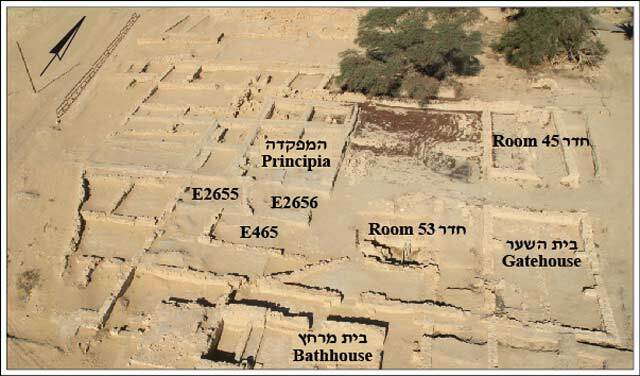 The site was previously excavated between 1987 and 1994–1995 by R. Cohen and Y. Israel (Cohen and Israel 1996); their excavations await final publication. 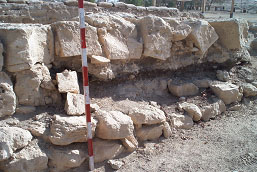 A bathhouse, built immediately to the southeast of the camp enclosure, was fully excavated by Cohen and Israel, but the adjoining camp was only partially excavated near the end of the excavation, in 1995. 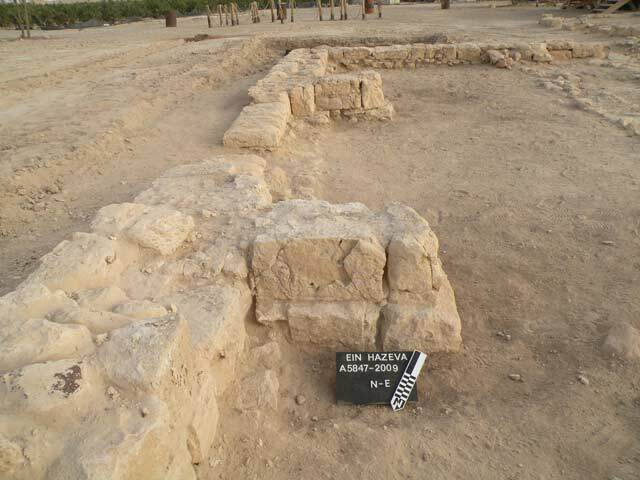 The recent conservation work and excavations took place in the camp, designated Area E in Cohen and Israel’s excavation (Figs. 2, 3). 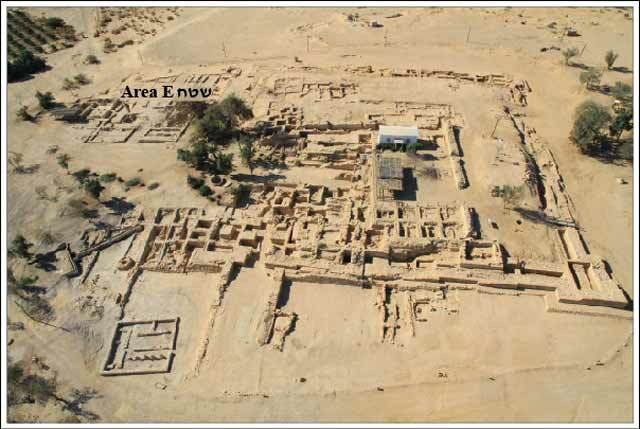 The aim of the excavations was to better understand its plan and phases of construction. Topographically, it is located next to the Iron Age IIb fortress and the Diocletianic fort (the quadriburgia). The camp (38.5 × 51.0 m; Fig. 4) was identified by Y. Israel as a caravansary or a palaestra from either the Late Roman or the early Byzantine period. These suggestions were based on the camp’s central courtyard (24.5 × 38.5 m), which is enclosed by a peristyle, and the bathhouse which adjoins it on the southeast (Fig. 5). However, they have been since disputed, and the enclosure has been identified as a cavalry camp (Erickson-Gini 2010). Three phases of construction and occupation were identified in the camp (Erickson-Gini 2010:97–99). The camp appears to have been built around the time that the Diocletianic fort was constructed on the tell, in the late third or early fourth century CE. It was devastated in the earthquake of 363 CE, which damaged the bathhouse and the fort as well. The camp was subsequently reconstructed and remained in use until the sometime in the sixth century CE. A second earthquake, in the sixth century CE, appears to have destroyed the second phase of the structure and the bathhouse, and subsequently they were both abandoned. During the Early Islamic period, in the eighth–ninth centuries CE, the bathhouse was reoccupied and converted into domestic quarters, and water channels that led to nearby fields were constructed over the ruins of the camp. In modern times, the British authorities paved a road across this part of the site. Traces of the road can still be discerned in the upper layers of the balks over the principia (headquarters) of the camp. Room 45 (see Fig. 4). An east–west balk (L100, L101, L200, L203, L300, L303; width 1 m) remaining from Cohen and Israel’s excavation and running across the center of Room 45 (3.8 × 12.0 m), in the northeast part of the camp, was removed; the finds were meager. A north–south wall (W785), running through the center of the room was exposed to its full length. The wall was made up of pilasters and collapsed arches over a layer of dark soil and ash (Figs. 6, 7). Coins discovered under the arches included a Roman Provincial coin from the third century CE (IAA 97941), coins of Licinius I (320 CE; IAA 97946) and Constantine I (324 CE; IAA 97937), and a Late Roman coin from 324 CE (IAA 97936). The soil over the Room’s floor (L300/L303) contained coins, mainly from the fourth century CE, attributed to both the first phase of the structure (late third or early fourth century to the earthquake of 363 CE) and its second phase (from 363 CE until the early sixth century CE). These included coins of Arcadius (383 CE; IAA 97942) and Theodosius (379 CE; IAA 97940), as well as several other Late Roman coins of the early fourth century CE (IAA 97939, 97944, 97945, 97947, 97948). A Late Roman coin from 346 CE was recovered on the surface of the site elsewhere in the structure (IAA 97949). Evidence of damage caused by the earthquake that occurred in the sixth century CE was found in the collapse of the western wall of Room 45 (W790); it fell into an open space west of the room (L600). Here, two complete oil lamps were revealed that had apparently sat in a niche in the wall. One belongs to a type that is commonly found in contexts from the first half of the fifth century CE (Fig. 8:1). The other is a Byzantine sandal lamp, commonly found in deposits from the second half of the fifth century CE (Fig. 8:2). Room 53. 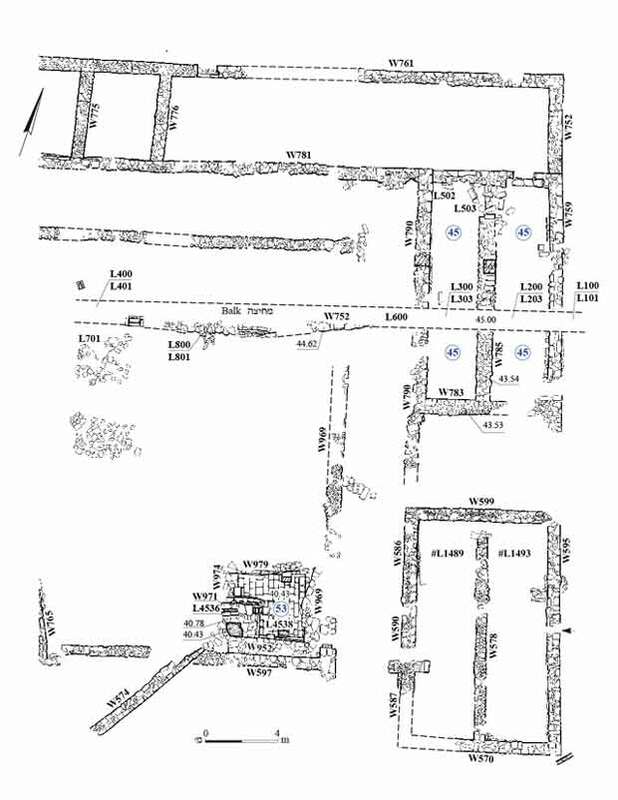 In the 1994–1995 excavation, a vaulted, subterranean structure (L4538; 3.7 × 4.3 m; Fig. 9) was discovered in the middle of the camp; it was dubbed ‘The Treasury Vault’. This structure was re-examined in 2003. It was well-constructed, with a paved floor and walls built of dressed stones that stood at least seven courses high. The vaulted ceiling was originally supported by two arches, the springers of which are still visible on the south and north walls. According to the 1994–1995 field notes by Y. Kalman, Area E supervisor, Room 53 was filled with collapsed debris, stone slabs that were used for roofing, arch stones and other building stones. The structure probably collapsed in the 363 CE earthquake. A smaller room (L4536; 1.8 × 2.2 m) was found fully standing in the southwest corner of Room 53. It appears to have been accessed by way of an opening (1.0 × 1.5 m; Fig. 10) in the ceiling next to the single arch which supported a stone-slab roof. One such slab was perforated and bore traces of charring, possibly from a lamp that hung inside the room. A layer of soil (depth c. 0.4 m) excavated inside the room yielded no datable finds. This room seems to have been constructed in the post-363 CE phase. In the Early Islamic period (eighth–ninth centuries CE), a water channel (L574) was constructed over the roof of the small room and across the debris of the rest of the structure, linking either the spring or a well with the agricultural plots to the south of the camp. The upper layers of three balks that remained from the 1994–1995 excavations to the west of Room 53 were excavated: the east and west balks of Sqs E2656 and E465 and the south balk of Sq E2655 (Fig. 11). The work in this part of the camp, identified as the principia, was preliminary and minimal, and did not reach the bottom level of the excavated squares. The finds included non-diagnostic potsherds and modern debris from near the surface. The excavation also sought to better understand the original architectural setting of the gatehouse, located to the northeast of Room 53 (Figs. 4, 11). This required dismantling a later wall (W590) that blocked the entrance in its western wall. Two pairs of pilasters set along the two longitudinal walls of the structure (W595, W586/W587; Figs. 12, 13) supported two arches that framed the gateway within the gatehouse during its first phase of use; unearthed in 1995, the pilasters and the area around them were now cleaned. The wall running down the center of the structure and dividing it into two (W578; Fig. 14)—probably a stylobate or a foundation for a series of arches—appears to have been constructed in the second, post-363 CE phase of the camp. This wall is essentially an extension of W785, running down the center of Room 45. This suggests that the original gatehouse was blocked, probably after it was damaged in the earthquake, and the entrance to the camp was removed to a different location. The gatehouse was originally paved, as evident by sections of the pavement found intact in the northern part of the room, on both side of W578 (L1489, L1493; Fig. 15). The stones making up the threshold in the eastern entrance to the gatehouse, along W595, bear clear signs of wear from the movement of wheeled vehicles in and out of the camp (Fig. 16). These wear marks are similar to those found in the contemporaneous North Gate at nearby Mampsis (Negev 1988:18). Conservation and Reconstruction work were carried out during these seasons. It focused on the western wall of Room 45 (W790), which collapsed westward. The investigations in the Roman cavalry camp in 2003, 2009 and 2010 revealed details of the stages of its occupation in the Late Roman or early Byzantine, late Byzantine and Early Islamic periods. It also allowed the correction of errors in the preliminarily published plans of the camp from the 1995 excavation. The gateway to the camp during the first phase of occupation, up to the earthquake of 363 CE, was located along its eastern periphery and framed by two large arches—one along the exterior, eastern wall (W595), and one along the interior, western wall (W586/W587) of the gatehouse. During this phase, Room 53, the subterranean vault, was located to the west of the gatehouse, directly opposite the entranceway and not off-center, as erroneously depicted in previously published plans. Underground vaults have been found in Late Roman forts in Europe (Ward 1911: Fig. 17). The area above the vault was probably the central shrine of the camp, the sacellum, which housed the aedes signorum (standards). Rooms located around the standards were used as offices for regimental records and payments, and the underground vaults of this type served as strongrooms (Watson 1981:131). According to Southern and Dixon (1996:88), this was an important feature of Roman military life, as soldiers were paid only three or four times a year after deductions for food, fodder and equipment, and their earnings were often deposited in vaults of this type, recorded and guarded by the signiferi. 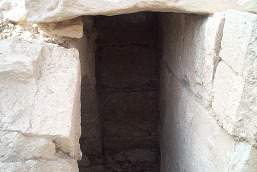 Other than the common use of this kind of vault, another possibility is that it was used to secure the transport of gold, which according to Eusebius was mined in the Faynan district (Meshel 2006; Hauptmann 2007:156). 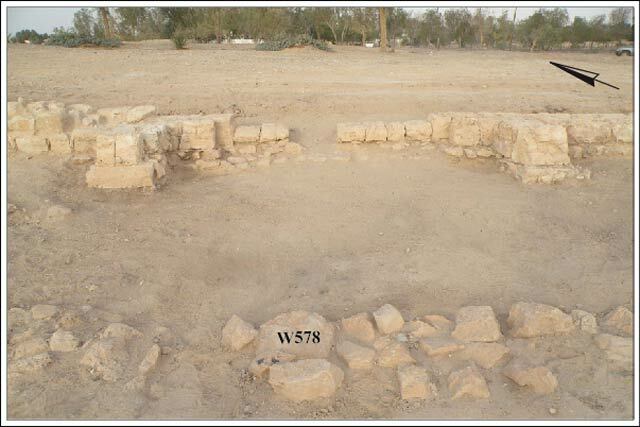 This may account for the series of small, contemporaneous forts that are located northwest of the site and as far as the head of the ascent of Ma‘ale Zafir on the road leading to Mampsis—Mezad Sayif, Rogem Zafir, Horbat Zafir and Mezad Zafir, all of which were excavated by Cohen (1984). This line of forts could have provided the needed security along the road from ‘En Hazeva to Mampsis. This also can explain the need for mounted forces: to patrol the road between the copper mining region of Faynan and the road leading up Ma‘ale Zafir to Mampsis. The cavalry camp and the fort on the tell appear to have been heavily damaged by the earthquake of 363 CE (Erickson-Gini 2010:79–80, 97–99). That event demolished the arched entranceway along the eastern periphery of the camp. Subsequently, both the camp and the fort were rebuilt and continued to be occupied into the late Byzantine period. As the original gatehouse was blocked, the camp must have been accessed either further north along W595 or along the western periphery of the camp. It seems that in its second phase of occupation, the enclosure continued to function as a cavalry camp. The ceramic evidence discovered in and around Room 45 reveals that a second, later earthquake damaged the structure sometime in the early sixth century CE, possibly bringing about the abandonment of the camp, if not the entire site. 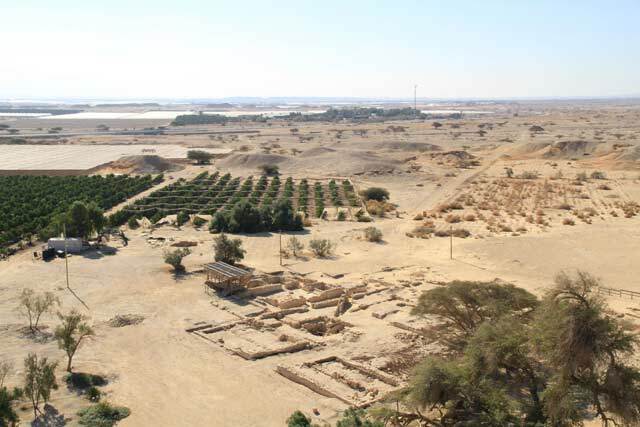 In the Early Islamic period (eighth century CE), nearby fields were irrigated by way of water channels, such as the one that ran across the ruins of the camp. Aharoni Y. 1963. Tamar and the Roads to Elath. IEJ 13:30–42. Cohen R. 1984. Ma‘ale Safir. ESI 2:64–65. Cohen R. and Israel Y. 1996. ‘En Hazeva — 1990–1994. HA-ESI 15:110–116. Dodgeon M.H. and Lieu S.N.C. 1991. The Roman Eastern Frontier and the Persian Wars (AD 226–363): A Documentary History. London–New York. Erickson-Gini T. 2010. 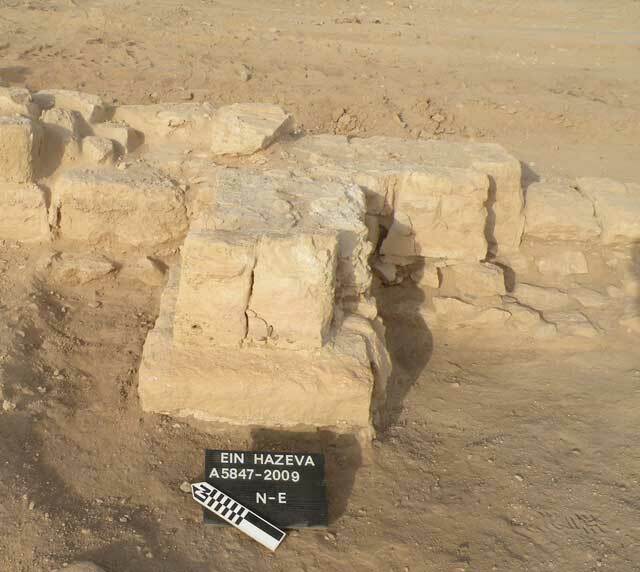 Nabataean Settlement and Self-Organized Economy in the Central Negev: Crisis and Renewal (BAR Int. S. 2054). Oxford. Erickson-Gini T. and Israel Y. 2013. 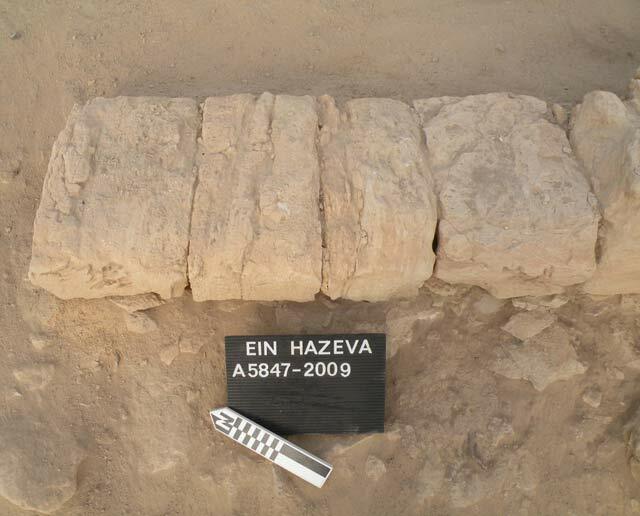 Excavating the Nabataean Incense Road. Journal of Eastern Mediterranean Archaeology and Heritage Studies 1:24–53. Frank F. 1934. Aus der ‘Araba. ZDPV 57:191–280. Glueck N. 1934–1935. Explorations in Eastern Palestine II (AASOR 15). New Haven. Hauptmann A. 2007. The Archaeometallurgy of Copper: Evidence from Faynan, Jordan. Dordrecht. Meshel Z. 2006. 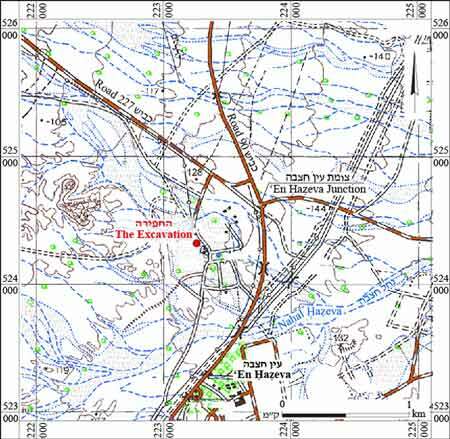 Were There Gold Mines in the Eastern Arava? In P. Bienkowski and K. Galor eds. Crossing the Rift: Resources, Routes, Settlement Patterns and Interaction in the Wadi Arabah. Oxford. Pp. 231–238. Musil A. 1907. Arabia Petraea II: Edom––Topographischer Reisebericht. Vienna. Negev A. 1988. 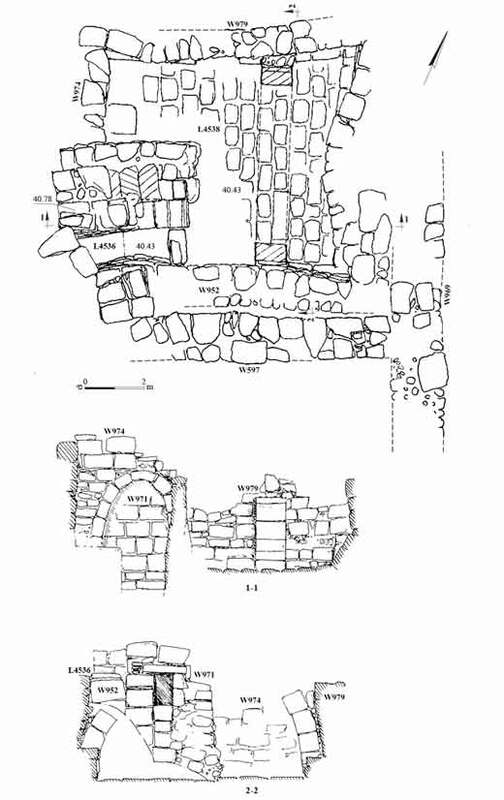 The Architecture of Mampsis, Final Report II: The Late Roman and Byzantine Periods (Qedem 27). Jerusalem. Southern P. and Dixon K.R. 1996. The Late Roman Army. London. Ward J. 1911. The Roman Era in Britain (The Antiquary’s Books). London. Watson G.R. 1981. The Roman Soldier (Aspects of Greek and Roman Life). London. 2. Aerial view of the site of ‘En Hazeva, looking west; the camp (Area E) is in the upper left-hand corner. 3. Aerial view of the camp, looking south. 4. The eastern part of the camp, plan. 5. Aerial view of the camp and the bathhouse, looking southeast. 6. Line of collapsed arches over a layer of ash in Room 45, looking west. 7. Line of collapsed arches over a layer of ash in Room 45, looking east. 8. 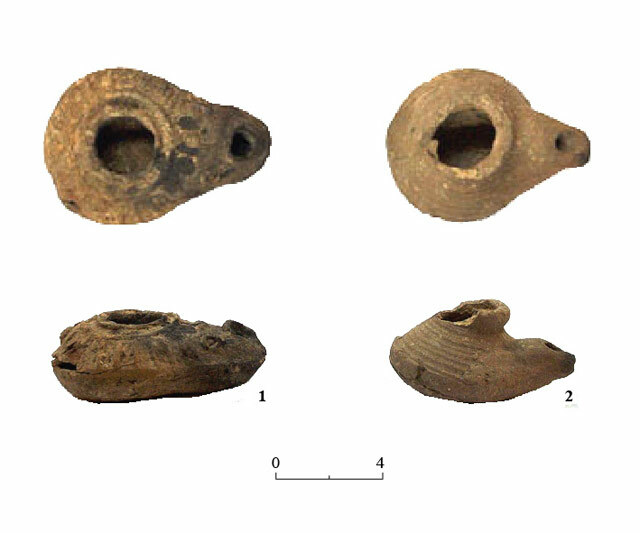 Byzantine-period oil lamps found in the collapse of W790. 9. Room 53, plan and sections. 10. Opening of Room 4536, looking north. 11. Aerial photo of Area E prior to balk removal, looking northwest. 12. The pilasters along W595, looking south. 13. The northern pilaster along W595, looking east. 14. Wall 578 and the eastern wall of the gatehouse (W595), looking east. 15. Pavement 1489 in the northwest corner of the gatehouse. 16. The worn threshold stones in the eastern entrance to the gatehouse.